The changing consumers eating habits, healthy snacks demand, and developing economies are the driving forces for the global market. The global market is segmented on the basis of types of ingredients that include potato, corn, rice, tapioca, mixed grains, and others such as cereals, legumes, and vegetable. The market has also been segmented as per the regions that include North America, Europe, Asia-Pacific, Latin America, Rest of the World (RoW) and the key countries. The global market is projected to reach $31 billion by 2019. In 2013, the Asia-Pacific market dominated the global industry on the basis of consumption, followed by North America. The Asia-Pacific market is estimated to grow at the highest CAGR with developing economies and an increasing disposable income of the consumers. The Latin American market is projected to have the second highest CAGR with Brazil as the largest market in the region. In 2013, the potato-based extruded snacks segment was the largest, followed by corn. The mixed grain-based products are estimated to grow at the fastest CAGR from 2014 to 2019. The key players invest in new product developments to meet the consumer demand and maintain a competitive edge in the market. This report includes market sizes in terms of both value ($million) and volume (KT). The report provides both a qualitative as well as quantitative analysis of the extruded snacks market, competitor analysis, and preferred development strategies by key players. The key players were observed to prefer new product launches and expansions as strategies to garner a larger share in the market. The key companies have also entered into agreements and collaborations to market new products. The report provides a complete analysis of key companies and a chronology of developments with respect to new products/technologies and their applications. It also analyzes the market dynamics, winning imperatives, and issues faced by leading players. This research study categorizes the global market on the basis of type and geography. 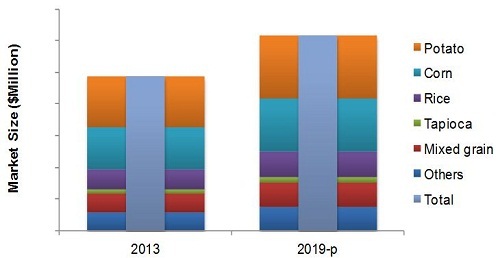 The extruded snacks market has been segmented by types that include potato, corn, rice, tapioca, mixed grain, and others used in the extrusion process. A wide range of extruded snacks available in the market including collets, pasta, and crisps added with flavors and spices. These products offer advantages such as convenience, value, and variety. The factors that drive the market include a busy consumer lifestyle and the snacking trends. This report includes the market sizes in terms of both value ($million) and volume (KT). The report provides a detailed analysis of the market by the product type that includes potato, corn, rice, tapioca, mixed grain, and others such as cereals, vegetable, and legumes. The global market segment by geography includes regions such as North America, Europe, Asia-Pacific, Latin America, and Rest of the World. It provides both a qualitative as well as quantitative analysis of the extruded snacks market, competitor analysis, and preferred development strategies by key players. The extruded snacks market is projected to reach about $31 billion by 2019, with changing eating habits, the any-time snacking trend, and a wide range of products in the market. In 2013, the Asia-Pacific market was the largest market. The Japanese market dominated the global industry in 2013. The market is fragmented, with leading companies that drive the market growth with new product launches, expansions, and acquisitions. The report further provides analyses of the prominent players and strategies to maintain their market position. Key players such as Frito-Lay North America, Inc. (U.S.), Kellogg Company (U.S.), Calbee, Inc. (Japan), and Diamond Foods (U.S.) have been profiled in the report. 10.3 Frito-Lay North America, Inc.
10.4 Grupo Bimbo S.A.B. De C.V.
10.7 the Lorenz Bahlsen Snack-World Gmbh & Co Kg. 10.8 Old Dutch Foods, Inc.
10.9 San Carlo Gruppo Alimentare S.P.A. Figure 14 Demographic Segmentation for Snackers.